This blog entry and all other text on this blog is copyrighted, you are free to read it, discuss it with friends, co-workers and anyone else who will pay attention. If you want to cite this blog article or quote from it in a not for profit website or blog then please feel free to do so as long as you provide a link back to this blog article. If as a school teacher or university teacher you wish to use content from my blog for the education of students then you may do so as long as the teaching materials produced from my blogged writings are not distributed for profit to others. Also at University level I ask that you provide a link to my blog to the students. If you want to quote from this blog in an academic paper published in an academic journal then please contact me before you submit your paper to enable us to discuss the matter. If you wish to reuse my text in a way where you will be making a profit (however small) please contact me before you do so, and we can discuss the licensing of the content. If you want to contact me then please do so by e-mailing me at Chalmers University of Technology, I am quite easy to find there as I am the only person with the surname “foreman” working at Chalmers. An alternative method of contacting me is to leave a comment on a blog article. If you do not know which one to comment on then just pick one at random, please include your email in the comment so I can contact you. I hold the view that the cesium isotopes which have been released by the accident in Japan will not show bioaccumulation in the same way as dioxin, DDT or PCBs will. We will consider the organochlorines first using a simple food chain. Plants, herbivores and carnivores. We assume that the animals will keep on growing for ever. We have a food chain, grass is eaten by a cow, a human then eats the cow. If we assume that the water insoluble organochlorines can not be metabolised by any of the organisms then the concentration will rise as we go up the food chain. This is because the majority of the food which is eaten by an animal is used to supply fuel for the animal’s energy needs and that only a little (lets assume 10%) is stored or used to make new tissues of the animal. So for the carnivore to grow by one kilo it must eat about 10 kilos of the herbivore, to grow the ten kilos of the herbivore it must eat 100 kilos of plant matter. If the original plant matter contained 1 mg per kilo of the organo chlorine than the plant eater will contain 10 mg per kilo while the meat eater will contain 100 mg per kilo of body weight, so as a result the poison is being accumulated in the organism at the top of the food chain. If the carnivore stops growing and reaches adulthood then it can get even worse as the carnivore will continue to absorb the poison, as a result the carnivore will keep on getting more and more of the organochlorine in its body until it finally drops dead (poor thing). As an alternative to dropping dead the carnivore may have difficulty reproducing, for example the shells of birds which have been exposed to some organochlorines as too thin to allow the birds to breed. OK it is a sad story but now we have to consider radioisotopes, some radioisotopes enter into the metabolism of animals and plants. For example lets consider cesium-137. The cesium will act as a potassium mimic and as a result it will enter many body tissues. But the good news is that as cesium is water soluble it is possible for the body to excrete it. It is important for use to understand the idea of biological halflife. This is the time required for an organism to lose half of an element. For radiological protection work it is important to know both the physical (radioactive) half life and the biological half life. By using both we can get the effective half life of the isotope. Thus we can calculate tbiological to be 70.5 days in humans, if we assume that the biological half life for cesium is the same in cows then we can do some maths to help us understand things. Rate of cesium loss = k . amount of cesium in animal. So each day the cow will lose about 1 % of the cesium which is inside it. This is a useful thing to know. If a cow absorbs 100 Bq of cesium each day then the cesium will at first build up in the first cow (black), but after about a year the activity will stop going up. It will reach a maximum of about 10 kBq. 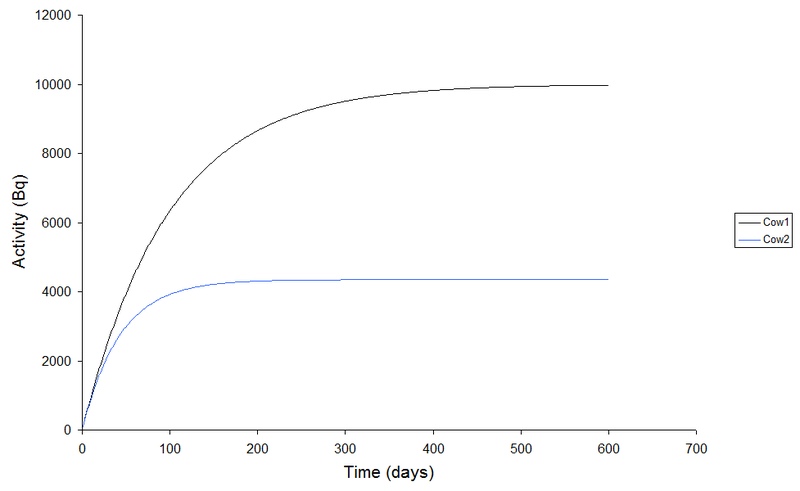 In a second cow (blue) which is being treated with Prussian blue the biological half life for cesium is shorter (thirty days). This second cow reaches equilibrium sooner and only reaches 4.4 kBq of activity. So clearly the use of Prussian blue has lowered the dose to the cow and to anyone who eats the beef from the cow. An alternative is to feed the cow clean food for some time before slaughter, the idea is that the cesium can be removed from the cow to make it safer to eat. 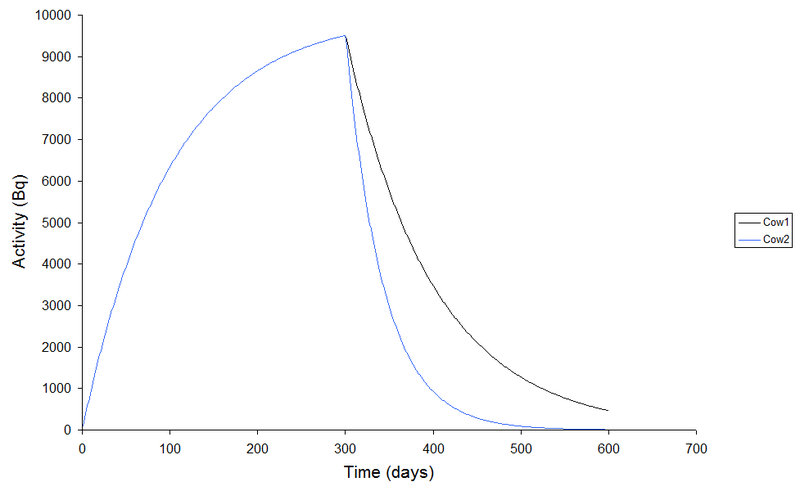 In the following graph two cows have been fed on radioactive food, after 300 days both are given a non-radioactive diet. Cow one is a normal cow while cow two (blue) is given Prussian blue in its diet. Below is the graph of how much radioactivity is inside each of the cows. Two cows fed on the same diets, one is given prussian blue the other is not. By the way humans can use Prussian blue to get cesium out of their bodies, but it is important to use the medical grade not paint grade of the pigment. Would you say that Prussian Blue is more potent than Zeolites for detoxing cesium? This is the first I’ve heard of Prussian Blue. Thanks for the great post showing how it can detox it from animals. Mark replies, I can not say if Prussian blue or zeolite is better for getting rid of cesium. I know that in bad cases of internal contamination with cesium it is normal to use Prussian blue to treat humans. The Prussian blue is very good for cesium but it is unable to deal with strontium. But as cesium is released at a lower temperture than strontium, more of the cesium than strontium will get out. Please note that the views and ideas expressed within this blog are my own personal views and are not necessarily shared by my employer (Chalmers University of Technology), anyone else or by any other organisation. Also please note that some activities, experiments and materials mentioned in this blog require specialist training and/or special facilities to perform or use safely. If you are in any doubt as to your competence to try out anything mentioned in the blog then please seek expert advice before attempting to do something. While all reasonable care is taken in the writing of this blog, I accept no responsibility for any death, injury, burn marks on the floor, boredom, social harm, property damage, feeling of self disgust or any other harm / loss caused as a result of an act, substance or process discussed in this blog.